Looking for new ideas for your container garden? Why not create a colorful container garden with plants that come back year after year. Often times, these containers can be brought inside to enjoy or during winter months and taken back out to the garden during warmer weather. What are some alternatives to annuals for containers? Think about the tough and durable perennials, that not only flower during the season but can add colorful foliage as well. Coral Bells and Hostas are two that come to mind because there are so many great foliage colors, textures and again flowering aspects of perennials it’s crazy! And many can be overwintered in a container, or taken out and planted in the perennial garden. Right along with the colorful annual grasses, hardy grasses work nicely in pots! One of my favorites is using Shenandoah Switchgrass with its great foliage, plumes and fall colors. It last all winter then regrows the following spring! And don’t forget the sedges as well! 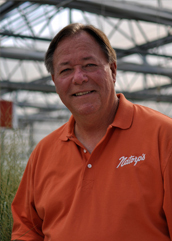 Tropical are one of the hottest categories of plants for outdoor containers. 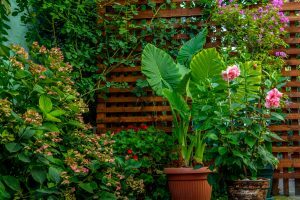 Think palms, ferns, crotons, hibiscus, mandevillas, alocasia and colocasia, bananas, gardenias, succulents – it just goes on and on. You can bring them inside during the winter or treat them as an annual. Yes, so many edibles also look and smell great in containers along with annuals and other plants. Cosmic Kale, Swiss Chard, Red Malabar Spinach, Thyme, Lavender, Peppers, Rhubarb and Horseradish with their great foliage – I call this dinner and a show! Again so much smaller growing evergreens that look wonderful arranged in large pots or containers. Probably would use all evergreens in the pots, rather than mixing with annuals, but they can put on a great show- year round! So think more than annuals when it comes to designing and planting those containers…sky’s the limit!